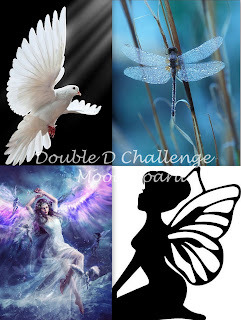 Time for another fantastic Challenge at the Double D Challenge Blog. Here's my Inspiration for you all! I used the Stampin' Up! products; Detailed Dragonfly and Dragonfly Dreams. Night Of Navy ink. I also splattered my background with Silver Metallic Craft Paint. My dragonfly was cut from Navy card stock and then Silver Glitter Paper, which I layered together. This was then popped up with Fun Foam for dimension. I had to cut very thin slices to make it work. Cheery Lynn Lace Corner Deco H die cuts in opposite corners. Beautiful dragonfly card with all the pretty shine and sparkle...the splatters are fabulous too, I have a ton of craft paint, why don't I think of using it this way...you have inspired me!! I love how your dragonfly is 'taking flight' too..a stunner my friend!! Great dimention on this pretty, glittery dragonfly. What a darling card for this challenge! Wow! This dragonfly is spectacular! The background is awesome. I really need to get back into using my paints and mists! I love a sparkly dragonfly and this is the greatest. He is just splendiferous and I love the splatters that he is floating over. WOW this is amazing! I have a very hard time designing with dragonflies ... don't know why ... guess they are just not my favorite thing with wings! LOL BUT, you have inspired me to use the dies/stamps I have because this is beautiful and works perfectly! Thanks for inspiration ... beautiful card my friend! Dragonflies do have the prettiest shimmer and you really brought that out in your creation. And with the splatters and the lifted wings you've given it such a sense of movement. Beautiful, Donna! What a magnificent card design. I love the background and it works wonderfully for the silver glittery dragonfly. I love all the shimmer and lovely texture on this design. WOW!! that dragon fly is AMAZING with the glitter paper. It's well worth the time to cut teeny-tiny foam pieces. I love just everything about this card. Look at that glittery dragonfly.....so pretty! Really lovely card design. Beautiful card! Gorgeous, I love the shimmer on the dragonfly, such pretty delicate corners, and love the background, pretty splattering! Okay, I just pinned this one. 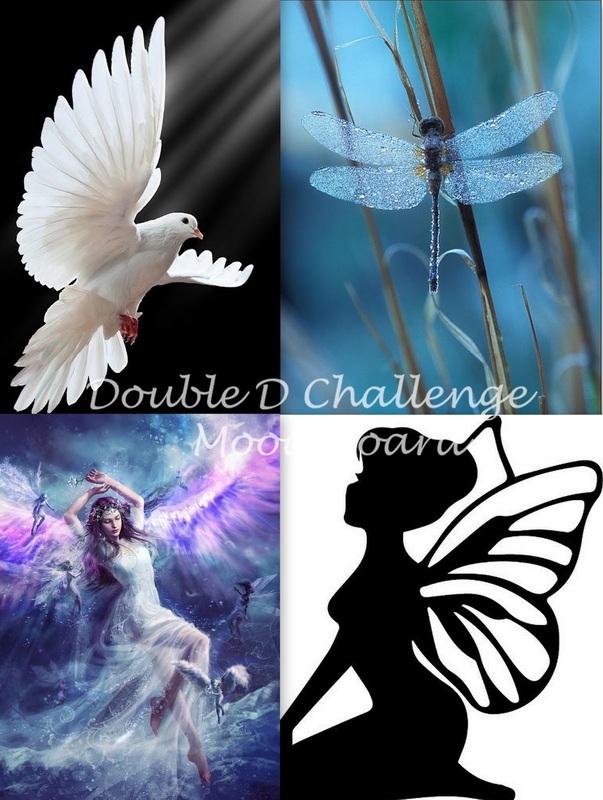 I love what you have done with that dragonfly set, and then how you layered the two panels together for dimension. The corner die cuts are perfect, I have never seen them before. Really pretty, great color choices too. This is fabulous!!! The layered dragonfly looks beautiful in those colors. I just love the sparkle and dimension! The corners are fabulous too and the sequins add just the right amount of bling for this beautiful friendship card! Oh wow this is beautiful Donna, absolutely love this – your design is gorgeous. Lovely detail and sparkle.